Boulder Arts Week = Great Arts Opportunities for Families! The first annual Boulder Arts Week is shaping up to have tons of potential! The line up looks great! Here are some fun family-friendly events to check. There is plenty more where these came from in many disciplines! The ones I am highlighting are FREE – some of the others cost. 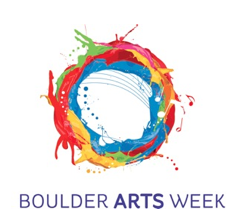 Boulder Arts Week is March 28 – April 6, 2014. Get the entire Boulder Arts Week schedule here. Frequent Flyers® Aerial Dance will present a solo aerial fabric performance on Friday, March 28th, 6-6:50 PM in the lobby of the Dairy Center for the Arts. The inimitable Kim Townsend will dazzle patrons with her strong, sensual, graceful and lovely performance. Free. 6 to 7pm. Stone balancing will be executed by Andrew Davis and Michael Grab at Ebin G Fine Park. Kids of all ages love to try their hand at rock balancing! 9am – 5pm. Downtown Boulder, Inc. worked with 66 budding artists from Columbine Elementary School, Casey Middle School and Boulder High School to create banner art for the 50 small banner poles that line the Pearl Street Mall. This year’s theme is “What I love about Boulder” and designs include images of local wildlife, Chautauqua Park, downtown Boulder landmarks and much more. Mediums used to create the banners range from collage to pencil art, water colors, and digital art. April 5, 2014: BMoCA Presents FAMILY DAY: Art That Soars!